Start running your business with PavoTheme new Responsive Opencart template. Pav Houseware will help you to achieve a success in your branch; do not let a big chance pass by. Focus on your work and be the best; use amazing features supported by Opencart with great possibilities which help you to build an online store with an ease. The theme is built on Pav Framework And Twitter Bootstrap with nice, simplistic, powerful impression layout. It is a solid template to start any theme or to customize to your needs. 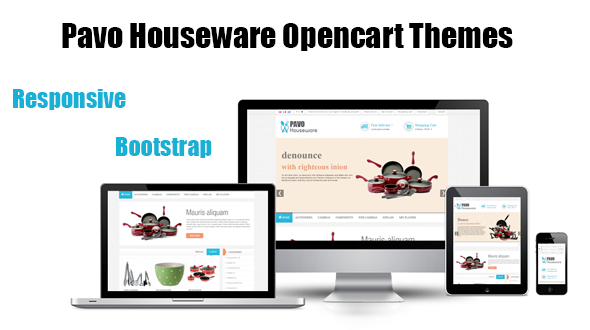 Pav Houseware Opencart Theme supports fully-responsive, HTML5, CSS3 as great solution to clients demand for your store that adapt to different screen sizes and look great on various types of mobile devices and tabless. Also It is properly solution for Opencart stores as Drink Shop , Food store, Restaurant, Kitchen store, Houseware store.